Who cannot recognize the gaunt figure of the “Knight of the Woeful Continence” astride his swayback and bony horse? Don Quixote is familiar to most of us, thanks largely to the Broadway musical Man of La Mancha. But the life story of his creator, Miguel de Cervantes, is largely unknown. A good portion of what we do know is speculation. Author Jaime Manrique credibly fills out the unknowns in this passionate and evocative novel. The title is a little puzzling: tantalizing us throughout the book so we can’t help hoping that somewhere in the narrative it will be explained. Have patience. It is neatly and satisfyingly resolved by an “Aha!” moment in the final chapter. Cervantes Street is historical fiction at its best. Compact and intense, it is consistent with all that we know of Cervantes’ life yet rich in invention. The characters are wonderfully drawn, the environments are detailed and colorful and the feeling is genuine. Manrique has even borrowed a bit from Don Quixote by having him meet and be rescued by a portly and resourceful man who is always ready with an appropriate proverb. There are also other events and people in Cervantes’ adventures that might be seen as inspirations for his peripatetic knight. What is striking about Cervantes’ life, and what becomes one of the main themes, is that up until his 59th year when he wrote the book that would make him immortal, Cervantes was an utter failure at everything he attempted, earning the vitriolic disdain of his wife and her family and indifferent dismissal from the reading public. His first novel, a pastoral called La Galetea, which was supposed to make his name and fortune, tanked. Yet through it all he never stopped believing he was destined for greatness. Is there perhaps a bit of the delusional Don Quixote in Cervantes? No doubt. There is another theme, however, born of the intense and personal conflict that propels the action forward: the corrosive and destructive power of jealousy and hatred. Cervantes Street is written as a dual memoir penned in alternate chapters by the two antagonists, Cervantes and his onetime friend and subsequent archrival and bitter enemy, Don Luis Lara. Each writes of Cervantes’ life from highly polarized points of view. It is an unusual but compelling format allowing each to be his own biographer. As a student, Cervantes formed a powerful friendship with Don Luis Lara who was of the privileged class. Both shared a passion for poetry, particularly that of Garsilaso de la Vega whom they both worshiped. They wrote and shared their own verses with each other, offering encouragement and gentle criticism as good friends and fellow students do. Their different social classes did not at first come between them. From such seemingly insignificant moments an individual’s destiny is determined. This moment sets the course of the conflict between them, and the subsequent narrative is one of contrast between the optimism and confidence of Cervantes, who had no advantages and rose above his own extreme suffering, and the arrogance and bitterness of his aristocratic and well educated rival who in all ways considered himself Cervantes’ superior and whose suffering was self induced. Cervantes was reputed to be a prodigious imbiber of strong drink, and a barroom brawler who once seriously wounded a gentleman. Tried and convicted of the attack, he was exiled from Spain. Cervantes remained a slave for five years. While in captivity he met a fellow Spaniard named Sancho Panza who knew a few things about survival and was willing to share. By his own account, Cervantes would not have survived without him. After many “hair breathed ’scapes”—all unsuccessful—Cervantes was ransomed by the Church and brought home. That was when his unsuitability for any kind of honest work became apparent. As a tax collector he could never keep his accounts straight and often landed in jail. As a landlord on his wife’s estates, he wasn’t very good at collecting rents. Ultimately, unable to succeed at anything else, he decided to be a novelist. While Cervantes was indisposed overseas, Lara married Mercedes knowing she still loved his friend and only because he told her Cervantes had been killed in the Battle of Lepanto. A religious man, Don Luis often asks for the strength to forgive Cervantes, but never finds it in his power to do so; it eats away at him until there is little left of him but the hate. The success of Don Quixote is a knife through his heart. Very rarely is the destructive power of hate presented this well. Like Captain Ahab pursuing the great white whale, Don Luis Lara is obsessed with the wrongs done him and cannot rest until Cervantes is vanquished. 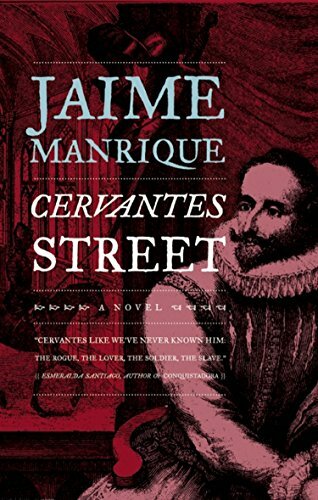 Cervantes Street is a gripping, adventuresome novel with profound insight into the ways in which we choose our destiny, whether for good or ill. Propelled by our dreams or nightmares, we are the sole architects of our lives.